Michigan farmers and other agricultural leaders are urged to attend the “Farmers for Schuette” campaign kickoff Friday, Sept. 21 near Portland. The rally for Bill Schuette, AgriPac’s Friend of Agriculture-endorsed candidate for governor, will begin at 8 a.m. with breakfast refreshments on the farm of Michigan Farm Bureau (MFB) District 4 Director Jeff Sandborn. A brief program will follow, including comments from Sandborn, MFB President Carl Bednarski, Schuette and his running mate Lisa Posthumus Lyons. Attendees can help themselves to campaign signs, shirts and hats to continue showing their support for the candidate. The free event takes place at 10227 Keefer Hwy., south of Portland; no pre-registration is required. Can’t make it that day? 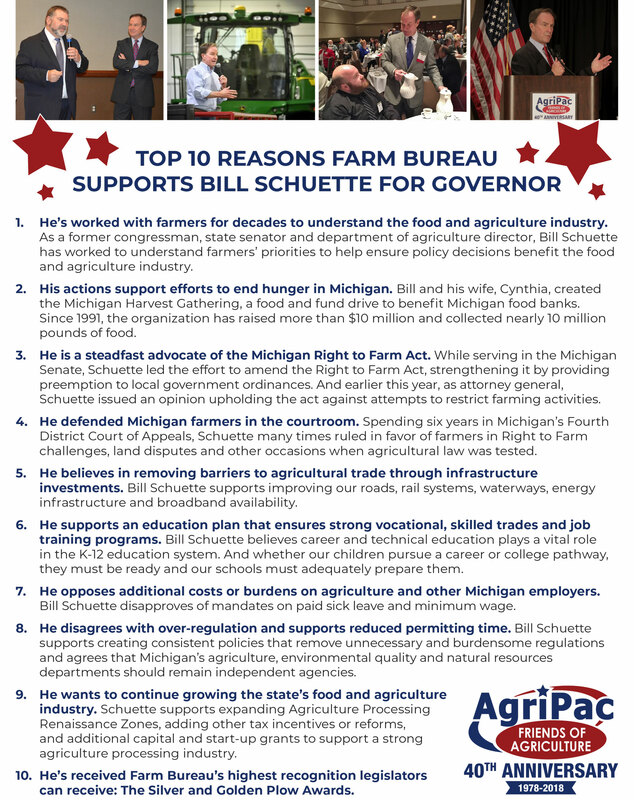 You can still help by sharing this “Farmers for Schuette” graphic on social media and using the hashtag #FarmersforSchuette.